What happens when Vogue publisher Conde Nast teams up with top Moscow restaurateur Arkady Novikov? Vogue Caf�, that�s what. Capitalising on the new wave of moneyed young Muscovite hipsters who can be seen at all the city�s hot spots, the chic pair have brought us this chic caf� near the Bolshoi Theatre. 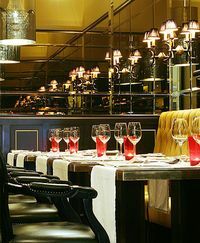 With its super stylish Anne Boyd designed dining room the Caf� Vogue is considered to be one of the glamour palaces of Moscow. Designed in plain colours: white walls and black sofas with low tables, smooth arm-chairs and sofas, shelves with �Vogue� magazines � everything is very functional and comfortable. Modern European fare featuring modern takes on Russian classics such as pancakes with black caviar or vinaigrette with sprats is served up in a buzzy atmosphere that keeps going long after the last meal has been served into the wee small hours.